Veue du Port et des Envirions de Ville Franche ... - DE FER, N.
Size : 5.6 x 8.2 inches. / 14.3 x 20.8 cm. 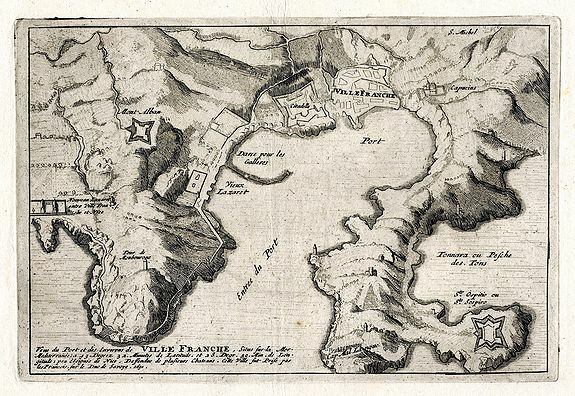 Description :Rare early map of Villefranche-sur-Mer near Nice in southern France. Includes Mont Boron (here called Monbourone) and the peninsula of Saint-Jean-Cap-Ferrat. Finely executed and detailed map, showing the forts, lazarets, the port, and some single buildings. With impressive display of the elevation and topographical features. Condition : Good impression. Wide margined copy with a large real watermark, visible when held against the light. Some faint soiling and age-toning. Light creasing to central area of the map.